Hollow heart can happen due to poor pollination causing the watermelon to develop cracks internally. 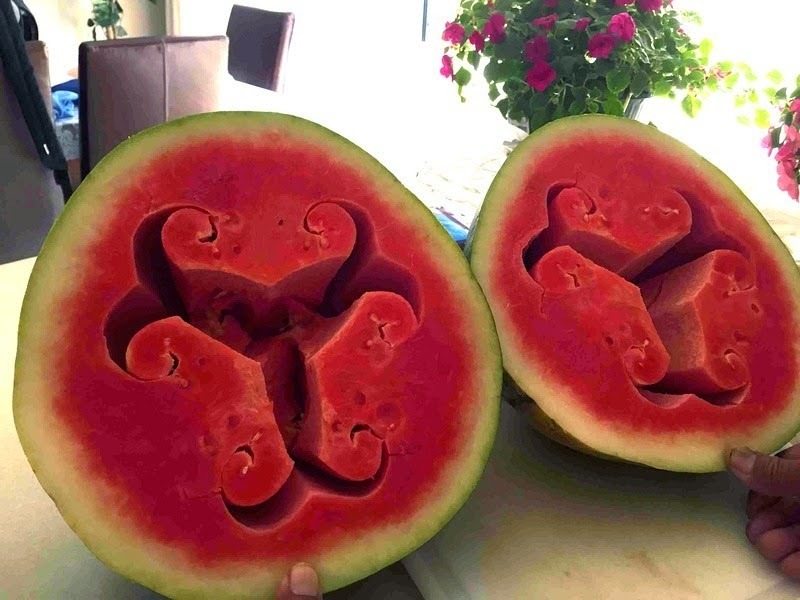 Cutting a watermelon, affected with hollow heart, across the body will reveal a well defined structure that may surprise those who aren’t familiar with the condition. Hollow heart is not a disease and the internal cracking has no negative impact on the watermelon’s taste or quality, and is entirely safe to consume. Many more pix at Amusing Planet. i guess it is appropriate that that looks like the biohazard symbol? Gorgeous! The cavity has a fractal-like appearance. In light of a more recent post, I wonder what you'd get if you poured molten aluminum into one of these.